Give your favorite recliner a fresh new look! 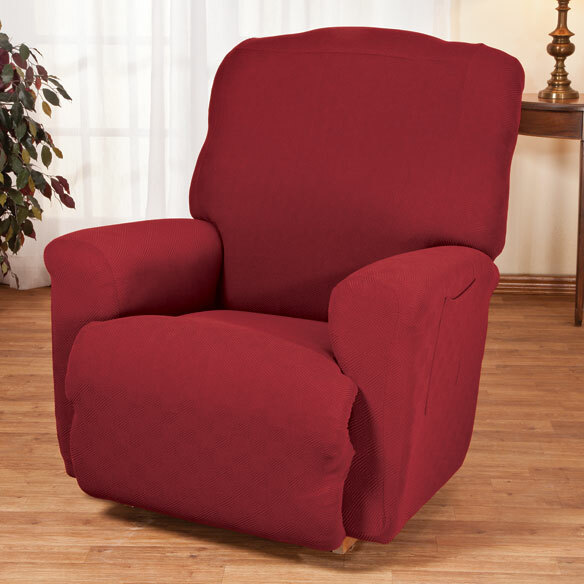 Soft, comfortable Newport stretch furniture recliner cover stretches for a smooth, snug fit. Easy-care, machine-washable fabric protects against spills and stains. 4-piece set: fitted back, seat/footrest cover, 2 arm covers. Chair cover offers a lever cutout with reinforced stitching. 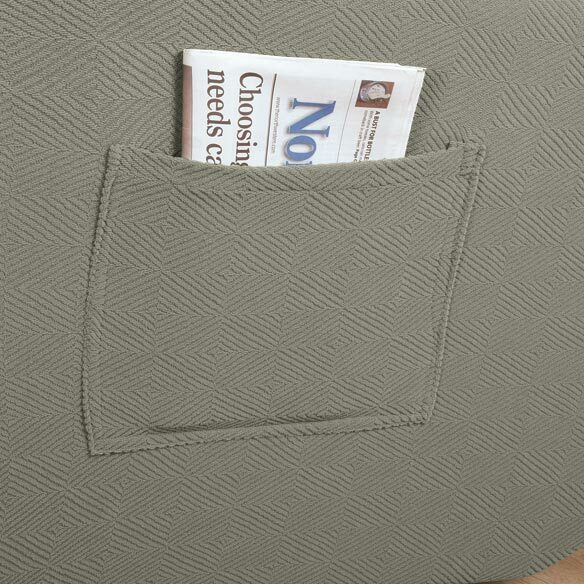 Built-in pockets for remotes, magazines and more. Furniture cover is easy to slip on; instructions included. Choose from 2 sizes and 3 colors: sage, wheat or cocoa. 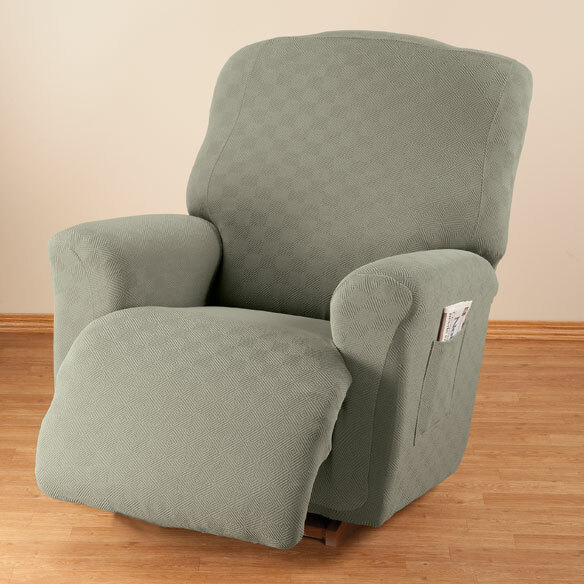 Regular fits recliners up to 82” when measured around back of chair. 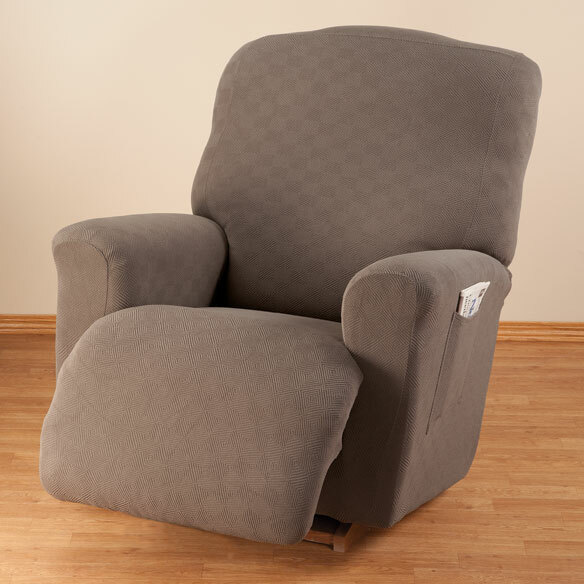 Jumbo fits larger recliners, such as La-Z-Boy models, up to 97”. After I placed it on my chair it is a wonderful accent to my dark brown sofa! Took awhile to figure out how to put it on, but once I read the directions it was pretty easy. Smart design and fit really well and my recliners are huge- maybe 28-30" seat and better than 95" around the back. One of the two that I bought has a defect and Service sent me a new one straight away without asking to return the other. Friendly fast and helpful- what more do you want? Very nice product. Item is what we ordered and better than expected. I can't do without this cover. This was used to cover a large leather recliner in our living room. After the purchase of the chair, we learned my daughter was allergic to leather and kept the chair covered with a fitted sheet so her skin did not touch the chair. We had tried other recliner covers but the chair we have needed a much larger cover so this company was the only one who had the 'Jumbo' recliner covers. It is perfect. It doesn't slide off so you're not having to readjust it all the time. Everyone thought we had new fabric furniture. You can buy it in different colors and change up your look - which we did for the Superbowl - and we plan on buying more colors for holidays, like Halloween and Christmas. You can also get this cover for other furniture such as, love seats, couches, and other chairs. Yes, great fitting cover nice fabric. My hubby went to heaven and this was his chair, so it helped me to make it look a bit different. After my cat attacked my recliner, I was tempted to throw it away (the recliner, not the cat). However, the slip cover disguised the damage, and my chair looks new again. Certainly cheaper than purchasing a new recliner. Easy to put on, too. I purchased two slipcovers for matching recliners. Each set comes in four pieces making it very simple to cover the chair. I was very pleasantly surprised at how nicely they fit and now attractive they are. I may buy another set in a different color in case I want to change things up once in awhile. COVERS DID THE JOB IN COVERING LIFT CHAIR RECLINER. THE JUMBO IS A LITTLE TOO BIG BUT STILL DOES THE JOB. I was pleased to find the recliner cover to be a perfect fit. And, the color was a good match for existing room. It was easy to put on our chair but my husband has a hard time to just stand up. The material of the cover is very stretchy so it crumbled each time he got up. It looks great and would probably be a great cover for someone who didn't have problems just standing up. It collects everything and won't stay on. It's made of a material that will collect and hold on to general debris like dog hair, particles. It is hard to fit if your cushions are not removable. I needed a jumbo recliner cover and this sounds exactly like what I need. To hopefully make my recliner look better. i bought one for my husband and he really likes it now I want one and one for spare. It helps protect the original upholstery when you have pets that use the chair for their bed. my recliner need cover. i hope its fit. Have a leather chair with small tears that need covering. Hopefully it will fit my recliner like I want it to. my sleeper recliner was showing wear so I bought this cover for protection to cover the worn places. We obtained a recliner that does not match my other furniture. This should be a great way of making everything work together. Easy to install and remove for cleaning and provides great comfort in winter and summer. My son wanted a good recliner cover to protect his chair from pets. This looked like a big enough cover and seemed pretty durable. Change up the looks of our chairs without the expense of buying new ones. I needed a Jumbo cover that was better than a one piece item and I like the color for spring and summer. Have a leather recliner that is still in good shape as far as the frame and most of the leather. Arms on chair leather tearing off didn't want to buy another chair so decided to try the chair cover first. Hope I will be satisfied with this product. Needed one for very large recliner. Needed a cover for my recliner as I have a cat and grandchildren. Well made, easy to apply. Easy shopping and on sale price. Will see about quality and size when I receive it. Hope delivery is prompt. Second time trying to find lift recliner cover that works. FIRST ONE I ORDERED FIT GREAT AND LOOKS GREAT TOO. I liked the look of the fabric and needed a recliner cover. First one I've found that will cover 100% of my recliner-rocker. I need to cover 2 worn recliner and I didn't want to reupholster since I plan to replace them soon. These looked like they would fit the best. Needed cover and liked the color. Happy with it. I needed a facelift to our chair that shows signs of much wear and yet the chair is structurally sound. Good Reviews and I liked the color. I was suppose to get free shipping with the code ECWelcome3 because I gave you my email address but there was no opportunity to enter the code. My lazy boy is smaller around, 77-78" will the standard size be too large? BEST ANSWER: Thank you for your question. Since the standard cover will fit chairs up to 82 inches, it may not fit as snug as the picture. We hope this information will be of help to you. I have small recliner - 68" circumference - around back, sides and front. Will regular be too big (assume it stretches to fit 82")? BEST ANSWER: Thank you for your question. If your chair measures 68" around, the regular will be big for your chair. We hope this information will be of help to you. I have a jumbo rocker Simmons recliner...will this fit?? BEST ANSWER: Thank you for your question. 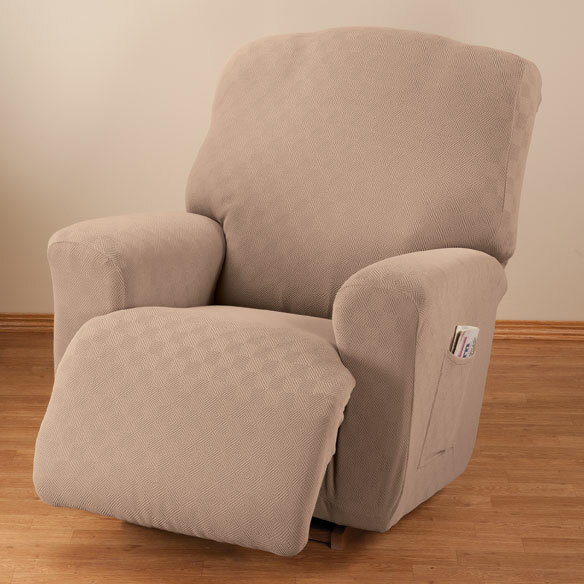 Our jumbo recliner cover will fit recliners up to 97”. We suggest measuring your recliner before ordering. We hope this information will be of help to you. I have large oversized recliner, 94 inches circumference. will jumbo fit? BEST ANSWER: Thank you for your question. Yes, the jumbo size will fit recliners up to 97”. We hope this information will be of help to you. No, the cover is not waterproof. will this fit leather push button recliners? BEST ANSWER: Thank you for your question. Yes, this should fit your recliner. We suggest you measure first. We hope this information will be of help to you. I need more details as to how to measure the recliner. Answers so far are not clear.? BEST ANSWER: Thank you for your question. You will need to measure around the back of the chair. We hope this information will be of help to you. Can this cover be bought with the arm hole on the opposite side? BEST ANSWER: Thank you for your question. At this time the arm covers only come as shown with the hole for the lever on the right side. We hope this information will be of help to you. where do I measure the circumference? ; just around the back? From bottom back to bottom front? ??? BEST ANSWER: Thank you for your question. The sizes listed of 82" for the regular and 97" for the Jumbo is measured around the back of the chair. We hope this helps! Problem. Getting up from the chair, the cover comes up with you. I have tried to pin the seat cover to the bottom of the back cover and tuck them in. helps just a bit. Still a problem. Do you have any suggestions? I was going to order another cover but now I won't. Help ?